We are proud to announce that Bill’s (our principal painter) long time wish has become true-the team at Aponia Painting Services have become volunteers! If you have a quick look, the photo below shows Bill (back row centre) with other great local painters joining the Dulux Surf Club Project at Carlton Park Surf Life Saving Club. So what is the Dulux Surf Club Project? 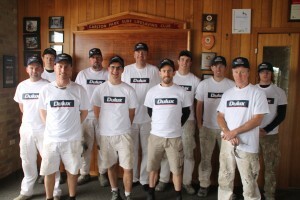 Basically, Dulux has invited their accredited members to join them in sprucing up surf clubs around Australia. At Aponia we could not resist the temptation to get out there and become part of a great community initiative. 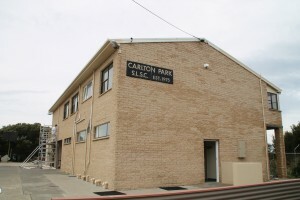 As the title suggest the target of our altruistic volunteering endeavour was the Carlton Park S.L.S.C. We were able to find out that the club serves as a focal point for locals to gather and provide a focal point for a range of activities. But more importantly the club provides well needed lifesaving services for the surrounding beaches. Painting of the Carlton club has extended the life of the building consequently allowing the club to continue its legacy for years to come! We find it important to point out that the primary product of choice for the Surf Club Project was Dulux Weathershield. It is well known that surf clubs are located in areas that withstand unforgiving weather making Dulux Weathershield one of our most reliable choices when it comes to selecting a product for our customers! Below is a clip provided for you to give you a quick insight what Aponia Painting Services were proudly part of. Enjoy and we hope so that by choosing us as your painter you will be picking a team that cares!